Even though summer is a great season o dress less and more comfortable but it still can be more challenging to find the perfect dress on this season, because it’s a warm weather, beach time and you may want to dress less layers and exposed yourself a bit more. Let's get started here more tips from Elo Today. 1) Since you won’t be able to use jackets, and scarves etc… in summer, it’s hard to have a new look every day. So you gotta be creative when is time to dress less layers and show you silhouette. I have been living in a hot weather for over a decade so I feel comfortable to give some tips and tricks for dressings for this seanon. In this example one layer top you have to be creative, it’s an opened back top with interesting design , its silk fabric, which makes it very appropriate to use on summer. 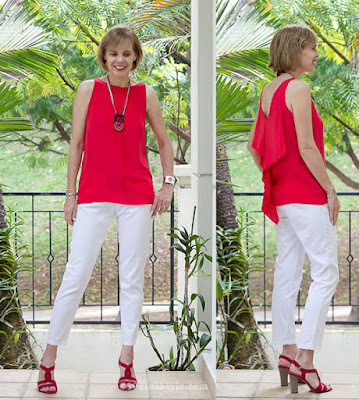 Use the red with white pants or skirt you will look younger , stylish and fabulous besides remain cool. 2) Whenever go to the beach you may prefer cover up than expose the upper skin to the sun. it’ an easy to do look and it doesn’t matter if anyone can see through the thin single layer because you will always be using it with a bikini or a something underneath it. You can be creative and it suits well with shorts or long skirts too. 3) I’ve seen a lot of women showing the bra straps under whatever they using, I personally don’t like see them, you can use some tricks to hide it. If you have a unique and interesting top design make sure you have a bra that can be worn invisible underneath. Use a bra clip with allows you use pretty much anything keeping the bra invisible and still be charming. 4) Summer makes it perfect for the light dresses, a high summer beach dress, it can be shorter than the usual ones and easy to wash, wrinkle free, not too expensive. For example a white dress of cotton or any color that can be used as tunic over pants making the look very casual and chic. 5) Silk with a good quality cottom is the perfect material to use on summer. It’s cool, has natural shine, will make you glamourous and helps to balance the body temperature on the warm days of summer.